"I have never stopped writing songs because when you get towards the end and you know that it's going to be a finished song it's very exciting, one of the most thrilling things that can be done and one of the most artistic things you can do as a musician..."
John said he had to work hard at writing songs. And his performances were so dynamic, so electrifying, that he always thought he had to give that same sort of thing on record. It was only toward what turned out to be the end of his days that he could be convinced and cajoled into the confidence to put out this set of him singing only his own songs. But for those who knew him and his music, this was the record we all wanted him to do. And, it really wasn't a new idea to him. Indeed, he had been planning the project over a number of years, gathering the recordings from the sessions that he liked, sorting through the songs he wanted to present. John died before it was finished, though. And thus it fell to those of us who were helping him to make the final choices and get it done. But John also wanted the chance to tell some of his story. Despite those lyrics, John Herald was not a fool from a one horse town. He was a New Yorker. Let's just let him tell it. "I'll just start from the beginning," said John, in about four hours of interview we did for these pages. "I was born in 1939 on Grove Street in Greenwich village. My father was a bohemian poet, Leon Serabian Herald. You wouldn't know him unless you looked in literary magazines of the 20s, 30s and 40s, he was published in all the periodicals of the day. So he had a lot of colorful characters around the house, poets, painters, sculptors. Kenneth Fearing, who was considered one of the Village top of the line bohemian poets, was my father's best friend and he lived about four blocks from us. My mother died when I was three and after she died it took the inspiration away from my father's poetry. From three to eight - five years - I was in five different foster homes. But if I expressed any unhappiness, my father would take me out. When I was nine, I went to a progressive boarding school, started by a fellow named Scott Nearing, who wrote books about the back to the Earth movement. "We moved to the east border of Greenwich Village. We lived on 13th Street and 3rd Avenue. That's where life started getting really interesting. We lived on the third floor. At the time it was the Bowery we lived on. There was nothing there but bar, bar, bar, pawn shop, pawn shop, flop house, flop house. They had an elevated train which ran the length of the third floor where we lived. So I could see into the trains. Because of the Third Avenue el, it made it kind of dark. It was not that far from the second world war and there were a lot of places where derelicts went to drink, Bowery places. "One day, when I was 16, my father took me to Washington Square Park on a Sunday. For a few years before that they would allow folksingers and bluegrass singers to pick in Washington Square Park from noon to six at night. I would go down there and meet a couple of friends from camps where I went in the summer. "Pete Seeger had come to one camp, Woodland, which is up in Phoenicia. He said, well I don't care if you can't carry a tune with a wheelbarrow, just let loose and you might be singing in a harmony, it doesn't matter. I didn't know much about folk music at the time. I'd heard about it, my father had taken me to different functions at which I'd heard Leadbelly and Woody Guthrie. "Pete was trying to get us to sing, but finally we did start singing and I heard my voice sort of soaring above everybody else, I had a really high voice and it was like a thrill. And that's where I found out that I just love singing, it was like an epiphany. I didn't know if I was a good or bad singer, I just knew it was fun. "So at Washington Square, one of the first people I saw after I started going there by myself was a fellow named Roger Sprung, a very imposing fellow. Extremely tall and my friends from camp kept nudging me to ask Roger if I could sing a song. Finally after about two or three Sundays I worked up enough nerve, and he said 'well, can you sing, kid?' and I said well I really don't know, so he didn't say anything, and finally he said, well you want to try a song? I said, yeah but I was very timid. So I started singing and I got through and he said, hm, not bad. And then he waited a few more songs and asked me to sing again. Then I started coming down and he was on me all the time and he wanted me to be the lead singer in his coterie around Washington Square. "I'd see people down there that we know today, here in Woodstock, Happy Traum, Eric Weissberg. Eric used to play with a fellow named Marshall Brickman, who co-wrote movies with Woody Allen. And just by chance I happened to go to the University of Wisconsin, unbeknownst to me, with Eric Weissberg and Marshall Brickman. On my first day there, I went to a freshman mixer, and Eric was walking out and I see him and say, golly are you Eric. And he said yeah, and I said, I've been watching you in Washington Square Park. He said really? Do you like bluegrass? So we got over to his place and he handed me a guitar and I said I don't play, I just love the music and can sing it a little bit. At the end of the year, Eric showed me a couple of guitar chords. "So I went back home and persuaded my father to give me $30 for a guitar. There was nothing but pawn shops where we lived and they had every kind of guitar imaginable, from every country imaginable. You'd go in and they had maybe 100 guitars. So I picked out a nice little Gibson, not knowing anything about brand names, it looked nice and sounded real nice. So I bought this guitar, took it home, played a couple of guitar chords and it sent shivers up and down my spine and I said, well that's the end of my schooling, I'm going to become a guitar player. I knew my father was not going to be happy, but he didn't come down on me hard, which was kind of surprising." "So we started playing at Washington Square and we would get crowds sometimes 15 people deep around us, so we knew that we were liked. The second summer, when we were just deciding that we would form a group, Eric Weissberg's mother came up with a name, The Greenbriar Boys, which was quite catchy. A guy came up to us and said he was from Vanguard Records and would give us a call to record. And we said to ourselves, yeah, sure. But lo and behold, Maynard Solomon gave us a call and we recorded on a quarter of a record, called New Folks and Joan Baez somehow heard of it. We're talking 1957. By 1958, Solomon wanted us to record our own record and Joan Baez heard that and wanted us to record with her. So we recorded two songs with her on her second album and then she wanted us to tour with her. So we went from totally unknown in one year to playing in front of thousands of people. We all loved her. To this day, I love her." One story of John's at that time concerned Bob Dylan's famous review in the New York Times, written by Robert Shelton, one of the key launching points of his career. 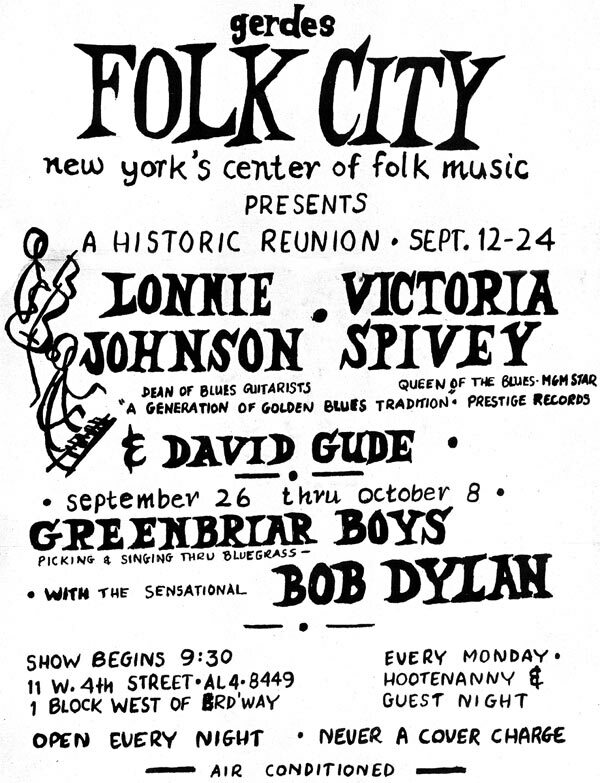 Seems Dylan was the opening act that night for the Greenbriar Boys at Gerde's Folk City. The Greenbriar Boys were asked if it was OK for Dylan to open their show. "By this time, Bob was a friend of mine, so I said fine. I wish he would return the favor now. We could have said no to Dylan, but Dylan would have ended up playing there with somebody. I liked Dylan quite a bit, so that's how that happened. 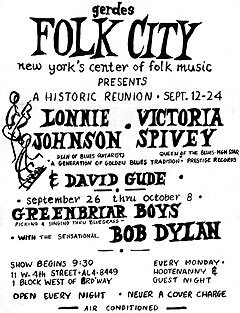 Anyway, Robert Shelton was the critic for the New York Times, wrote an amazing review of Dylan saying that Dylan was essentially going to be a star, going to go shooting straight up from there, from Folk City." Dylan has, in fact, visited John in Woodstock within the last decade, to swap songs. The Greenbriar Boys recorded three albums by themselves on Vanguard, one on which they backed up singer Dian James, on Elecktra Records, as well as on a 1959 collection called New Folks. In 1972, Vanguard put out a Best of the Greenbriar Boys. The group went through personnel changes, having included at various times Eric Weissberg, Bob Yellin and Ralph Rinzler, Frank Wakefield. The band with Yellin and Weissberg became the first touring bluegrass band made up of northeastern people. They played the big folk festivals, Newport and such, played on the Grand Ole Opry as substitutes for Flatt and Scruggs, played at Union Grove, where they were introduced as the Jews from New York; they toured with Johnny Cash, the Louvin Brothers and Jim Reeves. The group broke up in 1966, but The Greenbriar Boys, John, Yellin, and Weissberg have done tours every 12 to 15 years since, playing the Philadelphia Folk Festival, Champlain Valley Folk Festival and the Lincoln Center Folk Festival. "I was introduced to Woodstock at the age of three. When my mother was alive, they would come up and visit the Downers on Zena road. When I got to be around 19 or 20 I would come to Woodstock and camp out, maybe with a girlfriend. At 22 I started renting a cabin in the summer and then I met a native lady and we got married, Kim Chalmers Herald. The marriage lasted about six years." John and Kim remained close friends, though, throughout his life. "After the Greenbriar Boys broke up, I knew the folk song writers in New York, the guys who played poker up above the Gaslight, and though I'd come up to Woodstock and become a songwriter. "When I was married we lived down on Hasbrouk Lane and I became friends with Jerry Jeff Walker, who became big and moved to Lubbock Texas, which is a place where Willie Nelson and a certain coterie of folksinging cowboys became part of that crowd. Townes Van Zandt, Waylon Jennings. We used to wake up sometimes and Jerry Jeff would be sleeping out on our porch, he was a guy who sort of wanted to live a life like Woody Guthrie and Jack Elliot. Just had a little bedroll and backpack and travel all over. We just had some parties, sat around campfires until late at night..."
"The thing I like most about Woodstock, to this day, is the surroundings. 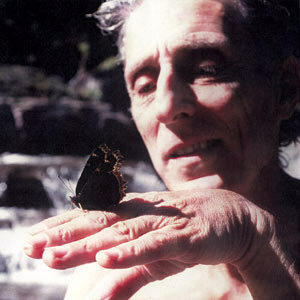 If I hadn't become a musician I would have been something in the wild world, the naturalist world. I majored at entomology at the University of Wisconsin. I moved to Woodstock and became what I call a forage ranger. I know a lot about eating and hunting for wild plants. And then became an amateur mycologist and mycophagist, one who specialized in eating mushrooms. One that goes hunting wild edible mushrooms, 50 different kinds. So I really lived for the summers because I know all the best swimming holes and follow all the streams for miles around. I go swimming at one of the towns up near here but I won't name it, but there'll be hundreds of trout all around your heads, you might be diving off a reef. And that is my big love for Woodstock to this day." A fire in 1969 destroyed his house and possessions. A couple of years in California ensued, where a reconstituted Greenbriar Boys once even included Jerry Garcia on banjo, a meeting with Michael Nesmith, whose song Different Drum was reworked and recorded by John, and made into the first hit for Linda Ronstadt's band, The Stone Poneys. She followed that with the Greenbriar's Up To My Neck In High Muddy Water, but it wasn't the same kind of hit. John came back to Woodstock, "hoping to become another Bob Dylan and found out that I was not a songwriter, that I had to work very hard at it. But I have never stopped writing songs because when you get towards the end and you know that it's going to be a finished song it's very exciting, one of the most thrilling things that can be done and one of the most artistic things you can do as a musician, writing your own music. And I've gotten a little action with that, mostly through the song Stewball that Joan Baez and Peter Paul and Mary recorded. And Jon the Generator, which Maria Muldaur recorded. 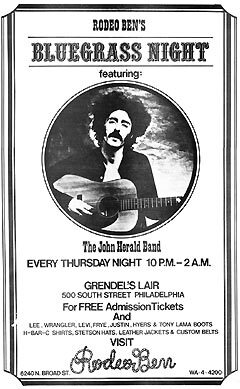 "Since then, I've had my own band called the John Herald Band, an electric band for a while. I was lucky enough to train some people who are much more famous than myself, including Larry Campbell, who's been with Dylan, Cindy Cashdollar who's now getting very famous as a lap steel and Dobro player, Gordon Titcomb, who's had a lot to do with Arlo Guthrie and Paul Simon, I don't know exactly what. I believe I was the first working band that they were in." Three solo albums and a couple of John Herald Band recordings have been released over the years and John continued to play in New York City at the Parkside Lounge on Houston Street and has been a charter member in the Woodstock Mountain Review, the large local collection that includes Happy Traum, Bill Keith, Artie Traum, Jim Rooney, Roly Salley, Cindy Cashdollar, Pat Alger, Eric Kaz and others. He even did a stint as a country music disc jockey on WDST radio in 1980. 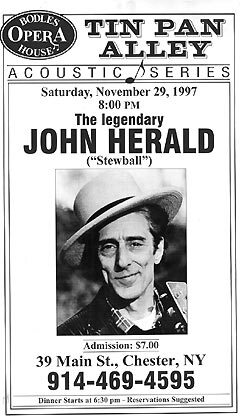 The John Herald Band "played most of the major folk festivals, and quite a few bluegrass festivals. And this was the time I had the longest band I ever had, consisted of Caroline Dutton on fiddle, Cindy Cashdollar on Dobro, George Quinn on bass, and assorted banjo players, Joe Deetz and another named Joe Val. Now, I have a band, but I don't always use the exact same musicians. But I use the best musicians in the northeast." The fame that John Herald sought did not ever materialize, but he never gave an inch, never compromised a morsel for anyone. "I always thought I was a little too folky for bluegrassers and a little too bluegrassy for folk fans," he said. But it wasn't fame for fame's sake, it was to share the joy of performing, the fruits of his hard won songwriting, and the charm of his warm heart. John always said that he'd never sing this song as well again as on this recording, which first appeared on the album Woodstock Mountains: More Music From Mud Acres. I'm sure people have different ideas when they think of John, but for me, this is always the song that pops into my head first. It flows so smoothly that you don't realize how beautifully crafted the song is, its slow descent down the guitar fingerboard drawing you in close for the payoff. John also wanted to acknowledge a debt to Uncle Dave Macon on this song. John went through a lot of titles for this song of loneliness and longing, never quite being satisfied with its name until relatively recently. The sharp political edge on this song reflects John's identification the have-nots of the world who struggle to earn a living, and sometimes rise up to fight the power. George Quinn said it best - "He wanted to go back to America in the 1930s. The era of the Great Depression and union activism. 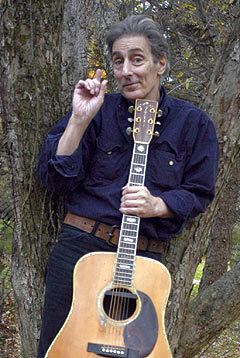 He was from the Pete Seeger school of music - justice songs, anti-corporate, Worker's parties…"
In the mid 1990s, Sally Grossman gave John some time in the Bearsville Studios, with Mark McKenna and Chris Laidlaw engineering. And Charles Lyonhart helped with the production. Those sessions make at least half of this album. Cut at John's last recording session where he sounded as good as ever. 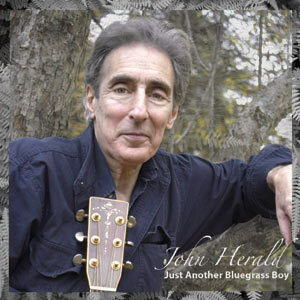 The most bluegrass-sounding tune on the CD, featuring beautiful work from the great Bill Keith on banjo and Jay Ungar on fiddle, it also features some of John's soaring vocal swoops and yodels. A long, live night at the Lake in 1983 yielded a release called Bring It On Down To My House, that had life as a cassette but never made it to the CD era. This was the classic John Herald Band, unelectricfied version, with Cindy Cashdollar and Caroline Dutton teaming with John and George Quinn. Joe Deetz was the banjo player in the band on the album. But this song, one of John's most lovely aching ballads, had no banjo. This one is for Charles. Sort of 'Blues in a Bottle' turned upside down. Trip's harp and John's great guitar solo propel this one along. Jay Ungar and Fooch provide a lush double-fiddle cushion for John's remembrance of a love that had it. This doesn't have to be the last John Herald album. There is much more material that can be culled and shaped into future projects. But for now, this one will have to do. Here's to you, John. Special thanks to Robbie Dupree, Artie Traum, Kurt Henry, Charles Lyonhart, Diane Chetta, Dan Schneider, John Sebastian, Charlotte Pfal, Happy Traum, Steve Stiert, Jay Ungar, George Quinn, Kim Chalmers Herald and the Thursday Committee.